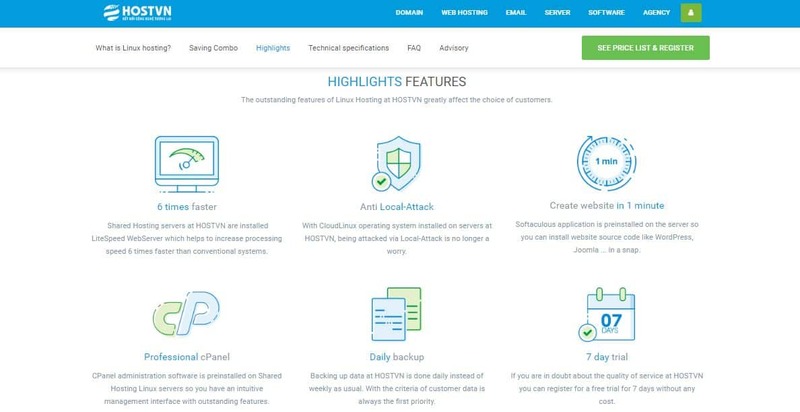 HOSTVN Review 2019: Is HOSTVN a Good Hosting? HostVN is a Vietnamese host with a big presence. A relatively new company, they offer a huge number of services, have a detailed website, and provide 24/7 customer service. HostVN is a Vietnamese website hosting company. In just over a decade since they were founded, they have attracted more than 26,000 mainly Vietnamese customers. Their website is available only in Vietnamese unless you let your browser translate it. HostVN offers a wide range of website hosting services, including (but not limited to) Linux hosting, WordPress hosting, SEO hosting, cloud servers, and dedicated server rental. They also offer domain registration and email services. HostVN has one of the most detailed feature pages I have ever seen, and they seem to have a feature for everyone! For beginners, they have a one-click installer, although it’s not clear for how many programs. For experts, they support PHP versions 5 through 7, plus FTP access, Cron jobs, and website traffic statistics. They also use LiteSpeed Web Server for processing speeds of up to six times faster than traditional methods. Whilst HostVN’s website is packed full of information about their packages, it’s lacking any information about their infrastructure. I’d really like to know where their servers are located, and whether they own their own data center, but all I really know is that their network is Tier 3. They also don’t state an uptime record, average or guarantee, which is quite unusual for a hosting provider. HostVN offers so many different packages, with something for everyone, that – to be honest – I find them a little bit overwhelming. There is a selection of packages for each of the Linux, Windows, WordPress, Cheap, SEO and Reseller hosting types. To make matters worse, each price can be discounted when you purchase a “combo” package that includes a domain name. What this means is that, although their prices seem to be in line with industry averages, it’s almost impossible to compare and contrast prices except on a case-by-case basis. The plethora of price plans is further compounded by a choice of contract terms. Cheaper plans can be purchased on six, twelve, twenty-four and thirty-six-month terms. Higher priced plans can also be purchased in one and three-month terms. A seven-day free trial is offered across all plans, so you have a short time to try before you buy. Domain registration costs extra (but can attract a ‘combo’ discount) while SSL certificates are free-of-charge. The 24/7 customer support team can be contacted by telephone, ticket, email and live chat, with my only slight reservation being that I had to wait a little longer than I expected for a live chat operator to connect with me. HostVN also has a massive knowledge base and FAQ section that seems to answer almost every question. HostVN has a very comprehensive (if a little too complex) website. They’re clearly pleasing their customers because they’ve grown to more than 30,000 customers, 40 employees, and two data centers since launching in 2007. Wondering how HOSTVN stacks up against other Web Hosting companies? Enter any other Web Hosting company and we will give you a side-by-side comparison.